One-sentence summary: A boy, born mute in 1950s New Orleans, becomes the vessel through which is fractured loved ones find peace and happiness. Do I like the cover? : I do, very much, but I do confuse the sparkles with snow, which doesn't work as this novel is set in New Orleans! First line: Bonaventure Arrow didn't make a peep when he was born, and the doctor nearly took him for dead. Buy, Borrow, or Avoid? : Borrow if you want an atmospheric Southern novel in the vein of Sarah Addison Allen. When the Wanderer inexplicably murders William, pregnant Dancy nearly dies from sadness, and in that moment her infant suddenly goes mute -- and develops a near supernatural sense of hearing. When born, baby Bonaventure remains mute and able to hear things no human can: the sounds of nature, the body, even his dead father in Almost-Heaven. Challenged by the literal sounds of sadness in his life and the voice of William, Bonaventure is a vessel through which his fractured loved ones gain some measure of healing. That description might sound a bit feel good-y and cloying, but the story doesn't feel that way. I was apprehensive about Lovely Bones-type treacle-y sentiment but the book steered pretty clear of that territory, too. This isn't quite Southern gothic nor is it magical realism, but it has elements of both in a delightful way. I laughed, I was caught up, I got teary, I was swayed. Leganski's writing has a kind of oral cadence to it; not precisely like a story being told aloud, and certainly not affected, but with a kind of lilt or tumble that makes it feel almost alive. Nearly a character unto itself. It talks so Bonaventure doesn't have to and at least once a chapter, if not more, I found myself pausing to savor a turn of phrase or particularly catchy splash of words. The story isn't told exactly chronologically; as a character recalls something, or as the omniscient voice of the novel clues the reader in, Leganski drifts into that memory, scene, or moment. It perpetuates the state of fluid emotion, inserting some family saga-ish elements into this story of a mother and son, a bereaved lover, injured widows, the faithful and faithless. A strong debut, high on ambiance and atmosphere, that reminded me of Sarah Addison Allen -- I think fans of her will enjoy this novel. It hits all the right emotions for someone who wants to be a little sad and a lot satisfied, and has some armchair time travel to boot. I'm looking forward to Leganski's next offering eagerly. 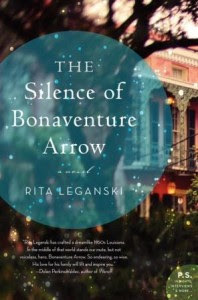 I'm thrilled to offer a copy of The Silence of Bonaventure Arrow to one lucky reader! To enter, fill out this brief form. Open to US/Canadian readers, ends 3/8. You've made me very curious about Leganski's writing. I love the southern setting. You'll love this then -- the ambiance is wonderful. I like the sound of this one, and the fact that it moved you so much speaks to me. The idea that the main character can't speak, but can hear such magnificent things really enchants me. I am entering your giveaway, but I am also going to see if I can find the book! 'Enchanting' is exactly the right word for it! REMINDED OF SARAH ADDISON ALLEN? Oh, NOW I'm excited. So glad you liked this one as I am reading this one very soon. I had a kindle version though so I can't drool over the cover but I adore that cover. Can't wait to see what you think! In person, the cover has a hint of sparkle -- it's so lovely! I'm really into magical realism at the moment (currently reading a book that seems to be going that way, too) so this sounds great to me. I like the sound of religious ideas mixed in, it must give a different atmosphere than other magical realism books. Charlie, it is really quite interesting, the faith aspect that saturates the story -- with the light touch of magic. It is enchanting. I just finished this book today and I was in tears by the end. I thought it was a beautiful book, I am so glad I read it. I got so teary!! And choked up! Really good -- and fast! I'm just starting this one today but just hearing it reminds you of Sarah Addison Allen already wins me over! I'll be back for your review after I've read it. Sounds like we can expect good this from Rita in the future if this first novel is any indication! I can't wait for Rita's next book. I just came across your blog, since I'm checking out all the participants in this tour. This is a wonderful review! I've just finished reading and reviewing this book myself, for TLC Tours. I wan totally enthralled by the writing! Leganski writes like an angel...and those characters, especially little Bonaventure! I loved this book and I also looked forward to seeing how it would end but can't say I was able to read it in one sitting. I did not love the cover but did not think about sparkles vs. snow...interesting. I have enjoyed bopping around to visit sites and everyone has given me so much to think about. I love revisiting this book. I agree with you about the spirituality angle, I have been trying to think about how I would categorize it since mid way through.